Some Israeli jokes are sequels to serious stories that date back thousands of years. One serious story comes from the Midrash. (The narrative part of the Talmud) In the serious story, there were two brothers who had farms in a mountain. One brother was childless and wealthy. The other had many children yet was poor. They both grew wheat on their adjacent farms. 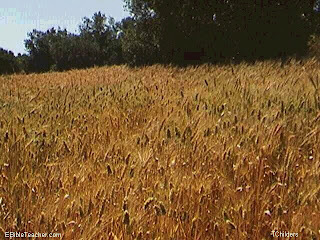 During the harvest season, after they had bundled their wheat into sheaves, the wealthy brother thought to himself, "What do I need so much wheat for? My childless brother has more bills to pay. I'll sneak some of my wheat to his farm." Meanwhile, the brother with many children said to himself, "My brother has no children. He gives so much charity with his money. I'll give him some of my wheat. He'll have more money to give. That will make him so happy." Each brother set out a few nights in a row, dragging sheaves of wheat to each other's farm. One night, they bumped into each other at the border of their properties. When they each realised what the other was doing, they laughed, put down their wheat and gave each other a brotherly embrace. And the place where they met is where the Bet HaMikdash, the Holy Temple was later built. A modern version of the story is told, which starts out the same way, with two brothers on adjacent farms. One is childless and wealthy. The other has many children and little money. The childless brother says "My brother is loaded. What does he need so much wheat for? I have lots of expenses. So he goes to his brother's farm and takes some wheat. The other brother thinks, "My brother has so many children, and I have none. I should at least have the consolation of greater wealth." So the second brother helps himself to his brother's wheat. One night, they both bump into each other. When each realises what the other was up to, they become furious and start beating each other without mercy. And the place where the brothers met, that is the same place where the Israeli Parliament (Knesset) building stands today. The story is widely known of the two mothers who came to King Solomon. They were each claiming to be the mother of a child. Neither would back down. King Solomon offered to cut the baby in half so it could be divided fairly. One mother agreed, the other withdrew her claim so the child could live. King Solomon decided that the mother who cared to spare the life of the child had to be the real mother. In the joke version, two women came to King Solomon with a young man between them. Each claimed to be his mother in law. King Solomon then said, "Let him be cut in two, then you both will be happy." One of the women said, "That's fine with me!" King Solomon tirned to her and said, You are his mother in law."